THE SCORPIO RACES is my new favorite book. The End. Okay, not really. I have loads to say about this amazing, thrilling, perfect (yes, I just wrote perfect) book. But I’m having a heck of a time figuring out how I want to say it. I’ve had ideas for this review rattling around inside my skull for weeks–ever since I started the book (I’ll explain why it took me so long to read it, I promise)–but everything I write seems trite and silly…perhaps because THE SCORPIO RACES was so stinkin’ awesome. And perfect. First of all, the “water horses” spoken of in the Goodreads synopsis above (which is the same as that which is found on the book's jacket-flap) aren’t the dinosaur-like creatures of the Loch Ness variety, nor are they wee seahorses. They are horses, but more. They are deadly, bloodthirsty capaill uisce (pronounced capple ishka), many of which leave their briny homes to set hoof on Thisby island every November. The details of the capaill uisce’s underwater survival–and whether or not they become sea serpents or a cross between sea serpents and horses or something like that when they’re not on land–is left to the reader’s imagination, which I appreciated. While the water horses certainly look like horses on land, there is something too wild and somewhat slithery about them, too. About Puck, who is one of the two point-of-view characters (the other is Sean): I rooted so hard for her, and not just during the actual Scorpio Races. She is courageous, but at the same time, she’s scared to pieces. She's scared of running out of food, scared of riding in the Scorpio Races, scared of capaill uisce, scared of Sean Kendrick (until she wants to kiss him--he is utterly swoon-worthy, in a wears-the-same-dirty-barn-coat-every-day-and-never-smiles kind of way), scared of what will happen to her and her little brother, Finn, when their older brother, Gabe, leaves them alone on the island while he works on the mainland (they’re orphans)....She’s such a complex character! One thing I loved about her was how much she loves Thisby. I love my hometown in the same way she loves hers–flaws and all–and I really related to her. I also related to her because of her relationship to her brothers. I have only one brother, while Puck has two, but that complex sibling bond was so well-portrayed. More about the characters: Each character in this book, no matter how minor a part he/she plays, has a story of his/her own. And that’s the way it should be. Every person we encounter throughout any given day has a story. The way people talk, the things they say (and don’t say)–it’s all a part of who they are. In too many books, minor characters function only as placeholders. Not in THE SCORPIO WARS. From quiet Finn and broken Gabe to Peg Gratton, the wife of the Skarmouth butcher (whom every man on Thisby loves because she could “cut [his] heart out neat”), every character is alive and an essential part of the story. The island just wouldn’t be the same without their rich personalities and backstories. 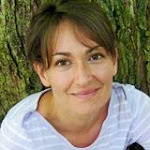 Don’t get me wrong–Stiefvater doesn’t spend a lot of time on the backstories of characters who aren’t front-and-center…it’s just that every single word in this book means something, and if a man requests “butter, milk, and salt” when a woman asks him if he would like sugar or milk in his tea, you know there’s meaning behind it. One more thing about characters: The animals are characters, too. And they’re every bit as multifaceted as the human characters. While I was tempted to see them as the villains in the story, they’re not. They may be bloodthirsty, but they’re not half as bloodthirsty as the real villain. He’s a bad, bad man. Now let’s talk about the setting: I was certain that I would be able to open my atlas and find tiny Thisby island somewhere off the western coast of Scotland…or maybe, if that wasn’t right, I would find it east of Ireland. But it’s a fantasy location! Coulda fooled me. This book, while certainly a fantasy novel, reads more like historical fiction with a bit of fantasy tossed in. Though I couldn’t tell you for sure when, in history, it takes place. Maybe 1930, maybe 1950. Because the location was a remote island, I figured they were a little “backward,” just as my hometown was–and still is, in many ways–a little behind the times. So that made it hard to pinpoint a date for this story. Can I tell you, I loved the fact that I wasn’t sure where Thisby was or when the story was taking place? It gave it a real timeless quality. [Stiefvater] not only steps out of the young adult fantasy box with “The Scorpio Races” but crushes it with pounding hooves. . . . If “The Scorpio Races” sounds like nothing you’ve ever read, that’s because it is. 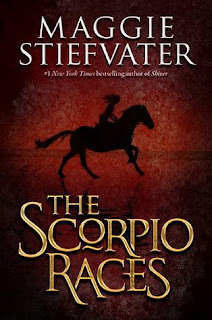 Click here to read more of these rave reviews, and to read about Stiefvater’s experience with writing THE SCORPIO RACES. There’s also a terrific book trailer, created by Stiefvater, who is a musician and an artist, to boot! 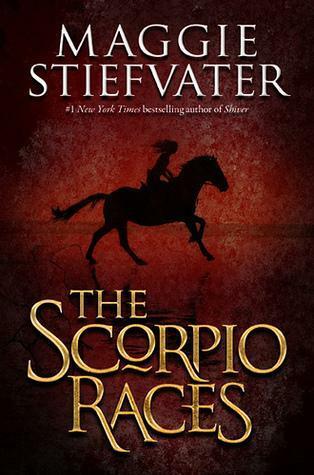 Finally, let me just explain why it took me such a long time to read this book, since I said at the beginning of this review that I would do that: I first became excited to read THE SCORPIO RACES back when a friend told me about it. I hadn’t read Stiefvater’s popular Wolves of Mercy Falls series–I’m not usually interested in paranormal romance–but this book…this book about water horses…sounded good! So I asked my husband to buy me a copy for Christmas. And then people started blogging like mad about THE SCORPIO RACES, and I hadn’t read it yet, and it took all my willpower not to dig through the bedroom closet, looking for my present. And then Christmas morning finally came, and I got my book. Hooray! I started reading it a few days after Christmas (after my husband had gone back to work)…and I knew it was going to be one of those reading experiences that doesn’t happen very often. Like, maybe a handful of times in a person’s life. In other words, I knew this was going to be crazy-good. So I decided to take it veeeeeeeery sloooooooowly. I wanted the story to last and last! But finally, after two weeks of slow reading, sprinkled with lots of pit-stops for tea and chocolate, I finished. And the ending was so perfect that I sobbed and sobbed. It rocked. Go out and buy a copy of this amazing book, friends! You won’t be sorry! This was probably my favorite book of 2011. 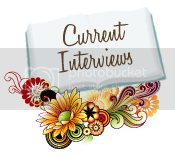 On her blog, Maggie Stiefvater has an interview with the actors from the audiobook, and the Sean actor's voice makes Sean even more swoonworthy, if such a thing is possible. Everyone else: If you haven't read the interviews pie mentioned or if you would like to see the video clip with the audiobook reading, go here. LOVED Sean. Loved Puck. Loved the book. The ending....so perfect. I tried not to cry but oh....each time I read that final paragraph, tears come. I can't believe Thisby isn't real. I envisioned Thisby as the same kind of close-knit hamlet in "Waking Ned Devine" with it's zany, colorful characters. Wonderful review Kim. I ordered this as soon as I heard about it from you, and just started reading. It's already fantastic! @Amy: You know, I'm jealous of you that you're reading it now, for the first time. Even though I plan on re-reading it in the near future, there's nothing like that first-time read. ENJOY IT! I know you'll just love this book. Obsessed already... I have just run off and bought it. :) Can't wait- I know it's going to be amazing based on everything y'all have said!!! Thank you! Thanks for such a great review! I just bought the book and can't wait to read it! 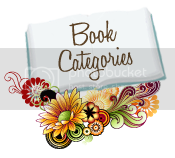 I just requested this book from my library. I thought you might be pleased to know that I #19 on the list of requests. Good thing they have about 10 copies. Just finished it--thanks for recommending this book to me Kim! It was a quick read because I couldn't put it down after a few chapters. Fascinating, those water horses! I like the setting and have always connected with having a horse for a true friend. One word describes for me what this book is wrapped up in-loyalty. I ejoyed it very much! Amazing book based on mythological horses with vibrant characters and a plot that will have you up all night reading. While written for young adults an "old" adult would enjoy this fascinating story. My daughter enjoyed it too, and we love that it has a heroine and not just a hero!